19Weekend Brunch is the perfect leisurely meal where you do not have have to rush off to work or to an appointment. And that is how we enjoyed our brunch at Sangers and Joe. “Sanger” is Australian lingo for sandwiches and “Joe” is a cup of coffee. Located in Old Town Pasadena, Sangers and Joe is a modern, market-style cafe open for breakfast and lunch daily and brunch on the weekends. The space is bright, clean and spacious with white subway tiles, a smooth white granite counter-top and community tables. There are pops of bright orange from the overhead lights and soothing blue highlights on the walls, while the decor is a mix of antique elements. 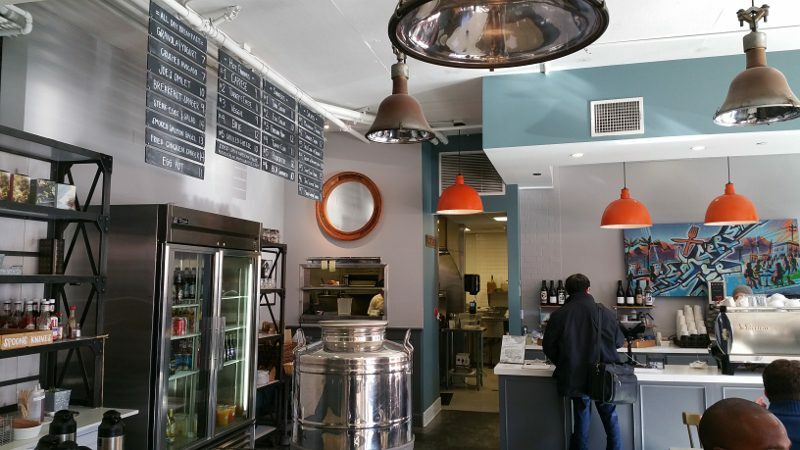 Before grabbing a seat, head up to the counter to order your food and drink. During the week, there is a full breakfast menu offering classics like granola and yogurt, egg dishes, bagels and french toast. The lunch menu offers a selection of sandwiches and salads. But on the weekends, the brunch menu is available, offering a few dishes not available during the week. 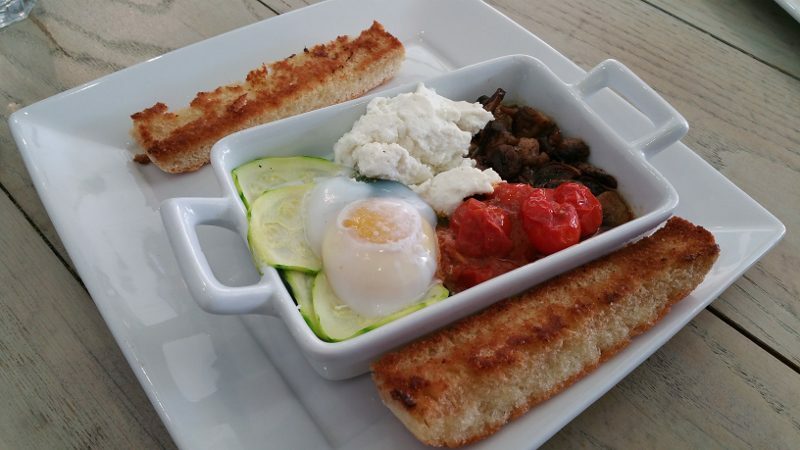 Oven Baked Egg Pot (baked duck egg, seasonal vegetables, fresh ricotta, crostini) – The dish comes with each element: mushrooms, zucchini, tomatoes, ricotta, all side-by-side. Once you break the egg and mix it all together, this is a perfect brunch dish, light, healthy and full of flavor. 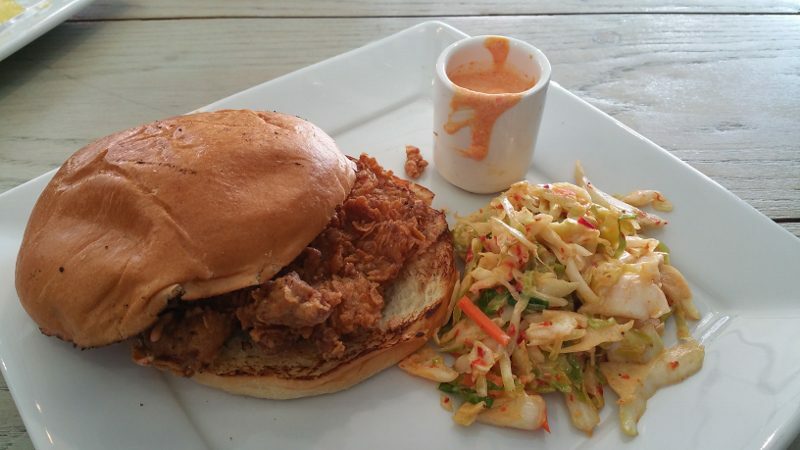 Fried Chicken Sanger (brioche, spicy coleslaw, chili-lime yogurt) – The crunch on the chicken was great and the sweetness of the brioche bun paired well with the chili-lime yogurt. This was a favorite. 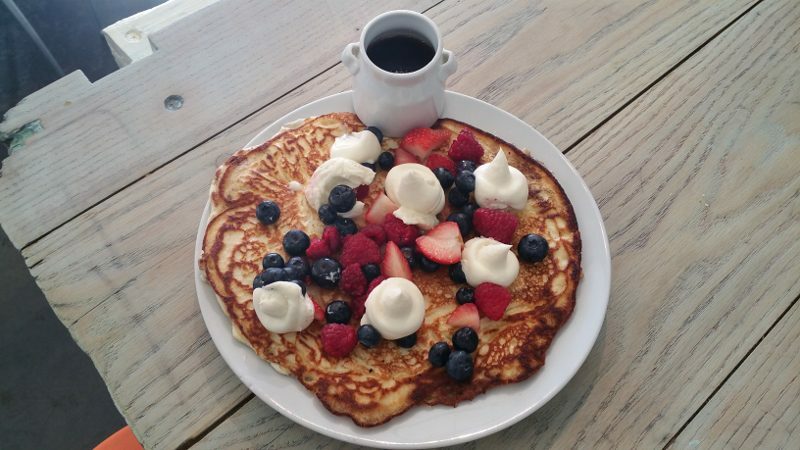 Lemon Curd & Pancakes (mascarpone, berries, lady finger crumble) – The single pancake fills an entire plate and is rather dense. The lemon curd and mascarpone make the dish very rich. If you want a sweeter item for brunch, this is the dish for you. The brunch menu also includes items that are available on the weekly breakfast menu, such as the crushed avocado and salmon Benedict. 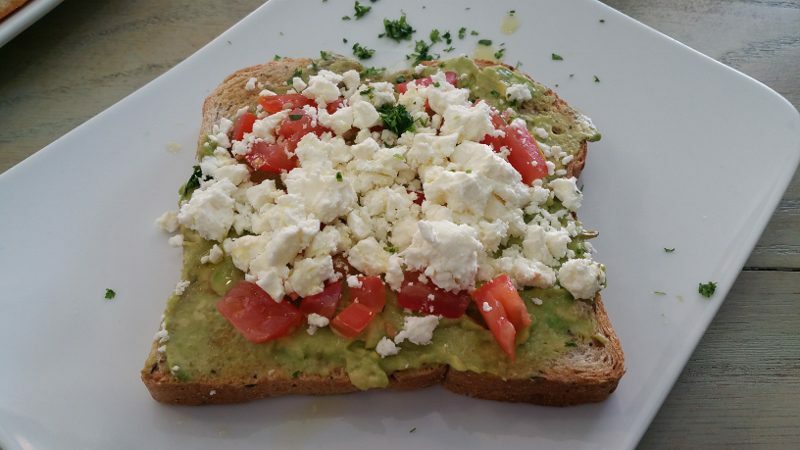 Crushed Avocado – Avocado toast is a pretty common item to find on menus these days but at Sangers & Joe, you can top the avocado toast with tomato and feta or with a poached egg. The toast is a multi-grain which also adds a different touch. 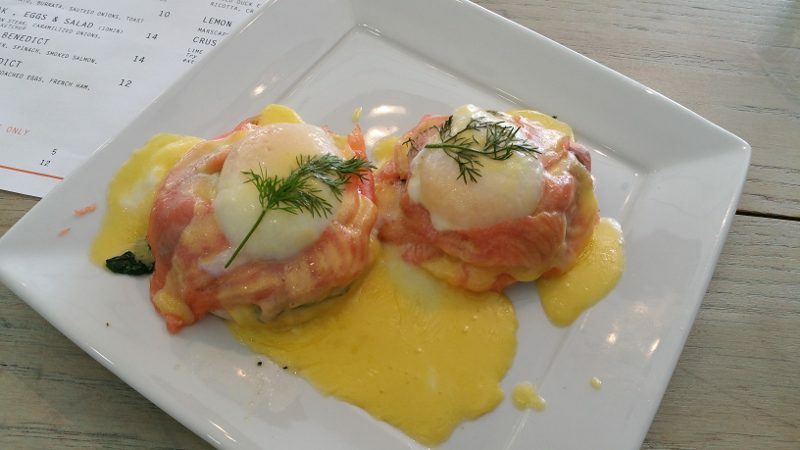 Salmon Benedict (English muffin, spinach, smoked salmon, hollandaise) – The smoked salmon and fresh spinach are a nice combination. The hollandaise sauce is not too rich. My only critique is that I would have liked the English muffin to be more toasted and crispier as it got too soggy under all of the ingredients and did not add anything to the dish. 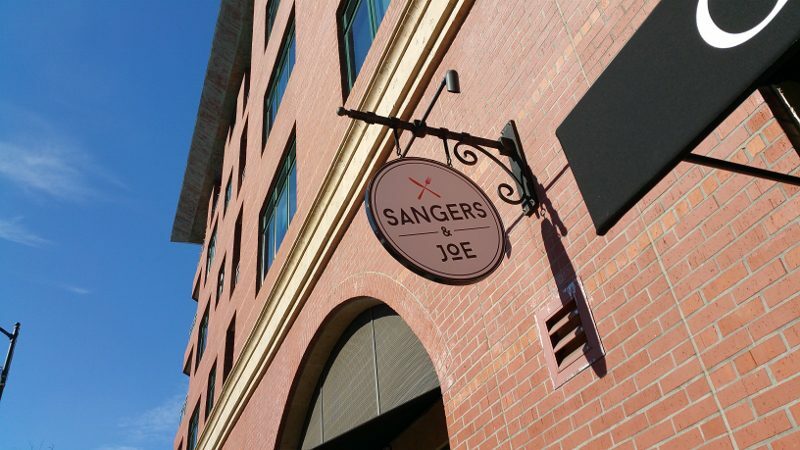 Sangers & Joe offers a full selection of coffee drinks, including Australian favorites Flat Whites and Long Blacks. And, on the weekends, mimosas are available for $5 or $12 for a carafe. This entry was posted in Food and tagged Breakfast, Brunch, brunch menu, Coffee, Lunch, Old Town Pasadena, Pasadena, Sangers and Joe, sunday brunch by Allison Levine.